The FAA has published new editions of the practical test standards for the private pilot and commercial pilot certificates. You can download the PDF versions here. The new standards become effective on 1 June 2012. If you’re training for one of these certificates and expect to take the practical test this summer, you should review the new standards carefully with your instructor. In particular, the new PTS reflect the FAA’s emphasis on aeronautical decision making and the use of scenarios in training and pilot evaluations. For more information about these topics, see the Risk Management Handbook (FAA-H-8083-2) [PDF], the training guide that describes ADM concepts in detail. You should also review the resources about scenario-based training at the FITS website. I’m presenting in a webinar about “Using PC-Based Simulations to Complement Flight Training” on 21 March. The presentation focuses on common mistakes and misconceptions about using PC-based simulations in flight training, and it includes a few examples taken from my new book on the topic. It’s an EAA-hosted event; you can register to attend here. Sometimes, however, stories about flights not taken are just as valuable, if less dramatic. A case in point: a Pilots N Paws mission that I’d planned to undertake today. 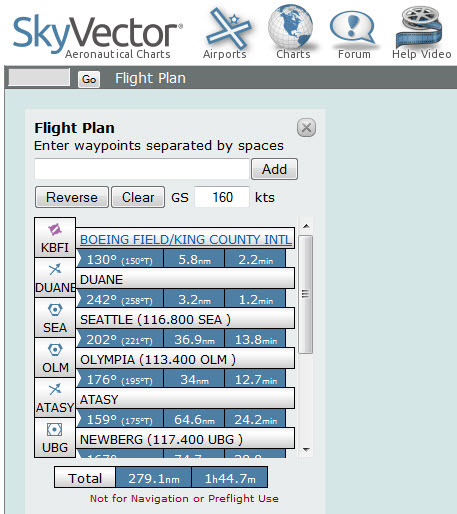 The plan (still) is to fly from Boeing Field (KBFI) in Seattle to pick up a dog in Roseburg, OR (KRBG) and deliver it to a shelter near Bremerton, WA (KPWT). The typical route for the 280 nm trip south (view it at SkyVector.com here) is one I’ve flown countless times in a variety of aircraft. It’s not an especially challenging cross-country trip, especially in my A36 Bonanza, but winter weather in the Pacific Northwest is, to be charitable, changeable and fickle. I watched the forecasts for several days, paying close attention to the forecast discussions from the National Weather Services offices in Seattle and Medford to get a sense of the overall trends. This time of year, I also keep an eye on the icing predictions and reports at the Aviation Digital Data Service website. The forecasts suggested high pressure and good VFR weather. No AIRMETs for icing marred the picture, and all of the airports I planned to use were forecast to remain in basic VMC all day. Some clouds were expected en route, so I filed IFR flight plans for the trips down and back. When I updated my official weather briefing early in the morning, the big picture hadn’t changed. Reports showed a few more clouds than expected the night before, but the forecasts still looked good, and there were no warnings about ice. I collected my flying gear, loaded the car, checked in with the folks at both ends of the flight, and got ready for the drive to the airport. Then my spidy-sense nagged me to check the weather again. I returned to ADDS, and the Supplementary Icing Information page confirmed my concern. It showed a high probability of significant ice, including the dreaded supercooled large droplet (SLD) variety, along the route, especially around and south of Portland. PIREPS from early-morning flights confirmed ice encounters at the altitudes I had planned to fly. My airplane is not, as pilots say, FIKI-approved. That is, I can’t legally “fly in known icing” conditions. Forecasts of ice are notoriously inaccurate, but pilot reports of in-flight icing are definitive. I canceled my flight plans, informed my Pilots N Paws contacts that the mission was off–again–and settled in at my desk to polish my presentations for this weekend’s Northwest Aviation Conference and Trade Show. Later, when the mail arrived, I experienced one of those coincidences that people often attribute to some sort of cosmic “woo.” The day’s haul included the March 2012 issue of AOPA Pilot magazine. After looking at the pictures (yes, I do look at the pictures), I turned to my favorite running feature, “License to Learn,” by my friend Rod Machado. That installment is titled “Decide to decide again.” Rod describes how his intuition sometimes gives him pause, and he chooses not to begin (or continue) a flight–sometimes even after starting the airplane’s engine and when doing so means staying in less-than-five-star hotels. Could I have made the flight uneventfully? Probably. But the mostly sunny skies promised in the forecasts never materialized. In the end, I’m glad to have taken a few minutes to write this blog post rather than a feature for “Never Again.” It’s not a great story to tell over a beer. Stories need conflict, tension, and a dramatic arc. “There I was” isn’t as compelling as “here I stayed.” But today I didn’t need to learn another lesson the hard way. 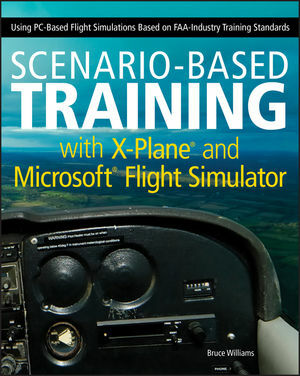 I recently did an interview about my new book, Scenario-Based Training with X-Plane and Microsoft Flight Simulator, on FlightTime Radio. You can download the mp3 audio podcast of the interview here. This change addresses the change to the icing intensity definitions, quantifiable icing rates, and an updated replacement for current terminology. It would also help satisfy NTSB Safety recommendations A­96­51 and ­060. 1. Light. The rate of ice accumulation requires occasional cycling of manual deicing systems** to minimize ice accumulations on the airframe. A representative accumulation rate for reference purposes is 1/4 inch to one inch (0.6 to 2.5 cm) per hour (See TBL 7-1-7) on the unprotected part of the outer wing. The pilot should consider exiting the condition. 2. Moderate. The rate of ice accumulation requires frequent cycling of manual deicing systems** to minimize ice accumulations on the airframe. A representative accumulation rate for reference purposes is 1 to 3 inches (2.5 to 7.5 cm) per hour (See TBL 7-1-7) on the unprotected part of the outer wing. The pilot should consider exiting the condition as soon as possible. 3. Heavy. The rate of ice accumulation requires maximum use of the ice protection systems to minimize ice accumulations on the airframe. A representative accumulation rate for reference purposes is more than 3 inches (7.5 cm) per hour (See TBL 7-1-7) on the unprotected part of the outer wing. Immediate exit from the conditions should be considered. 4. Severe. The rate of ice accumulation is such that ice protection systems fail to remove the accumulation of ice and ice accumulates in locations not normally prone to icing, such as areas aft of protected surfaces and any other areas identified by the manufacturer. Immediate exit from the condition is necessary. Most instrument-rated pilots now fly with GPS-based navigation equipment (according to AOPA, 78 percent of its members rely on GPS as their primary navigation tool). To use an IFR-approved GPS when operating IFR, the unit’s database must be current or you must verify the accuracy of the data (for more details, see note 4 in AIM 1-2-3: Use of Suitable Area Navigation (RNAV) Systems on Conventional Procedures and Routes). Keeping a typical GPS unit up-to-date usually involves downloading fresh data to a card every 28 days. 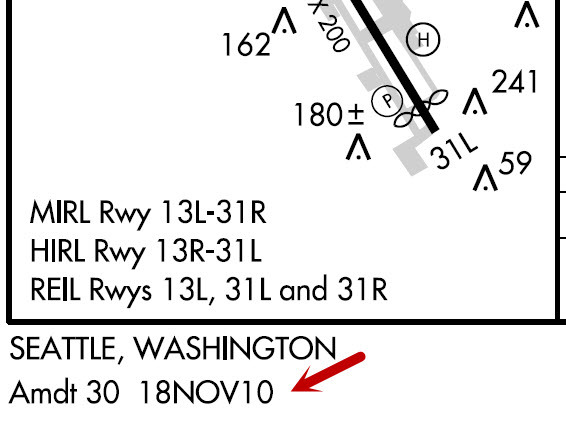 Of course, the dates of those updates don’t always fall conveniently between trips, and FAA has outlined procedures to help pilots ensure that the data in GPS avionics matches the vital information on current charts, especially instrument approach plates. The best description of the procedure amendment reference date and how to use it is in Jeppesen Briefing Bulletin JEP 09-C (PDF)–even if you use charts published by FAA AeroNav Products. The Jeppesen briefing bulletin includes a simple flow chart that helps you use the procedure reference date.